With more and more Battle Royale type of games being in development, 2018 is looking like the year of Battle Royale. The games in this article started life as April Fool’s jokes meant to fool both fellow developers and their fans. Somehow, both games stuck around only because of their positive reception by the masses. The games in question are in early access with the goal of making a full release on Steam. Please note that I will be comparing these games to Big Daddy PUBG – 100 player lobbies, entering the map via airplane, weapon mods, vehicles, and of course shrinking battlefields. Air strikes and supply drops related mechanics maybe in consideration. 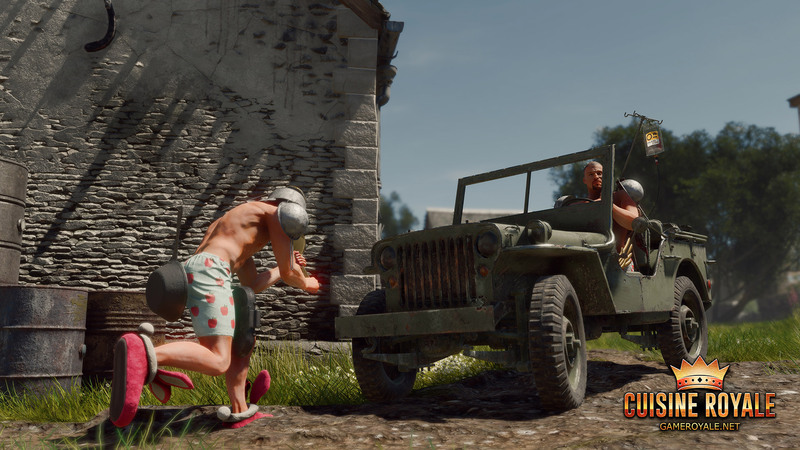 What started off as an April Fool’s prank among developers is fast becoming a favorite among Battle Royale enthusiasts . Cuisine Royale is a WW2 / kitchen themed BR set somewhere in a location that resembles Europe’s Western Front. Players do not drop in from aerial transport, instead they start the match at a random spot on the map. Battles start with only 30 players compared to the usual 100 player counts. Nearly naked and alone, players have to think fast or become a quick kill. Thankfully, cars make traversing the map easy, potentially reducing the time between encounters. The kitchen theme is truly on display as every piece of “armor” you acquire are indeed pots and pans used in everyday cooking. But it doesn’t stop there, as food is what used in place of med-kits. There are also special items that will boost performance, like the medical dropper – a literal IV bag strapped on your back granting the ability to regen health at a faster pace. Other items like the glasses will increase weapon accuracy and the bunny slippers that allow you to jump to greater heights. The possibilities are endless and the devs are adding more with each update. Cuisine Royale prides itself with the most honest system for Loot Boxes – in the form of the humble refrigerator. These trusty boxes appear in many places around the map, and are free to open. The RNG isn’t as severe as there are different tiers of refrigerators with all their contents labelled for easy access. The tide of battle usually shifts in favor of those lucky enough to find them. It doesn’t take much to eliminate players in this game. A few bullets is enough to take down any player, regardless of how much armor they have. Squads have to be extra careful as there are no chances to revive a fallen teammate. Once you go down, you go down for good. The zone also adds to the tension as it does more damage initially compared to other BR games. All in all, Cuisine Royale is looking like a fun alternative for players who just want to have a good time. It’s goofy and it definitely doesn’t take itself too seriously. The graphics look amazing, and although some aspects still need some tweaking in order to be a solid game. But honestly speaking, with the game as fun as it is now, I don’t think there will be too many changes to the core of the game. With that in mind – Do you have what it takes to be the Top Chef? From the minds of Totally Accurate Battle Simulator, comes a physics-based EVERYTHING parody of the battle royale genre. Totally Accurate Battlegrounds, aka TABG, is yet another April Fools’ joke meant to give fans something to do while they wait for the next version of Totally Accurate Battle Simulator to come out. A round of TABG starts like this: Riding flying trucks, around 33 players launch themselves onto an island, find weapons, and survive with what ever they have in hand. At the very least, your character will have plenty to choose from when it comes to clothing options. Nothing is more intimidating than a knife wielding chicken-man in a sharp suit. Accurate physics is the name of the game here. Well… as accurate as the silliness allows. Bullets are projectiles and are subject to bullet drop. Weapons have a kick to them like the 50 caliber sniper rifle and the rocket launcher. Even the vehicles are subject to the grueling forces of gravity. Being a Totally Accurate game, players shouldn’t expect to move with precision and accuracy. The weapons in the game are a mix bag from several different time periods. You will find WW2 weapons like the M1 garand and MP40 as well as AKM’s and RPG’s. There are even battle axes to satisfy your viking cravings. For times when you want to keep the enemy at bay, feel free to look for riot shields that protect you from the front when equip and offers protection for your back when you have another weapon equip. If the fire fight gets too intense, you can always throw down a decoy to get some heat off of you. Playing solo, you will exit to the main menu once you get killed. Being in a squad is more forgiving as you will be in a downed state once your health reaches zero. For some reason, you lose health faster in a downed state as compared to other BR games. Also, there is no set timer while reviving. Allies need only stand beside you and hold the button until your health becomes full. Meaning that you will get up faster if you have more health the moment you go down. A side effect of being revived on a team is dropping all your weapons on the ground. You can pick them up once you’re back. The zone is probably the most epic thing about the game. In most other BR games, a zone shrinks until only one person is left standing. In TABG, huge walls drop from the sky and slowly complete the circle, leaving players on the outside to die a horrible death. The final circle takes place in an ever shifting battleground where pillars of rocks rise from the depths of the Earth accompanied by rising lava. It’s times like this where you will need to unleash your inner Obi Wan and take the high ground for that guaranteed win. May the last silly looking person win!